EASY...This card went together quickly using the new Birthday Delivery stamp set, Birthday Memories Designer Series Paper, a 4 x 5 1/4 piece of Real Red Card Stock and 4 1/4 x 5 1/2 Whisper White Card Stock card base. I cut out the fox image along with the super cute banner and using dimensionals was able to get him to pop right off the card. The Stitched Shaped Circle Framelits provided the perfect anchor for this little guy. So Fun! BLING... You've got to have a little bling on a card even if it is for a man right? The star in the Metallic Enamel Shapes were just the perfect touch! EXTRAS... Can really make a card. 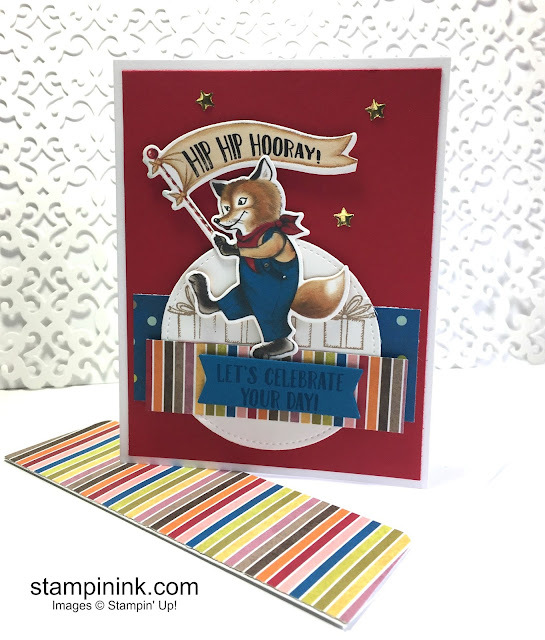 I used the striped patterned paper from the Birthday Memories DSP to give my envelope flap that WOW! factor.